The automobile changed the neighborhood. A gas station replaced Schmidt’s carriage factory at Detroit and Kingsley streets. At the Division Street end of the block, an auto dealership opened next to what had been the Ferguson Cart Company. In 1960 the Treasure Mart opened a consignment shop in the old mill. It was the first of many businesses that would become the Kerrytown shopping district. Miller’s new shop concentrated on the more lucrative business of providing millwork for the boom in house construction that followed the Civil War. 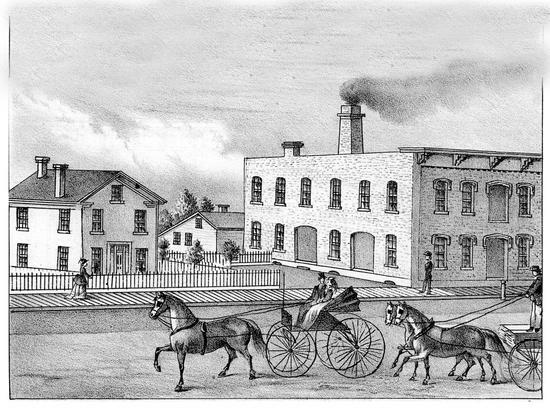 Throughout the 19th century, Detroit Street hummed with industrial activity as other planing mills and carriage manufactories plied their trade nearby. In 1878, Miller sold the mill to Herman Krapf who renamed it the Detroit Planing Mill and kept it operating until his death around 1906. By the 1920s this part of town was no longer a business center and the building was frequently vacant or used as a warehouse. In 1960 it was leased by Mrs. Demaris Cash who had dreamed of opening a retail consignment shop. She named her store the Treasure Mart, and today it ranks as one of Ann Arbor’s most cherished institutions.